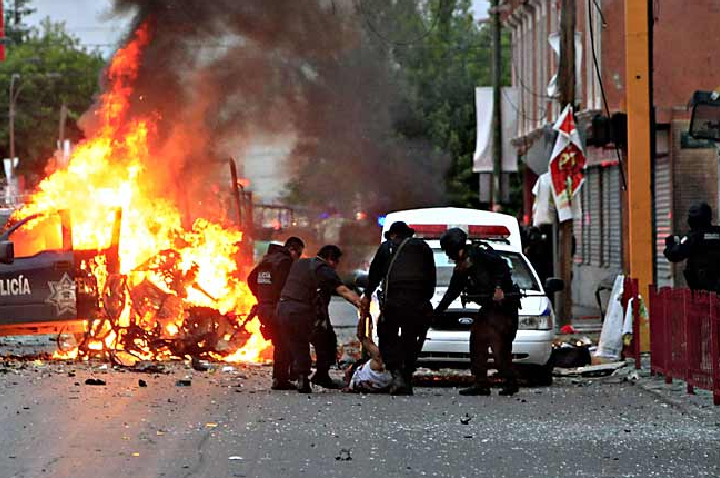 An apparent car bomb on a main street in downtown Juárez yesterday evening destroyed a Federal Police truck on patrol, killing four persons, and wounding another eight. Only one of the victims has been identified, Dr. Guillermo Ortiz, who was on the scene providing medical assistance when the bomb went off. While Attorney General Arturo Chávez, speaking in a press conference in Mexico City, ruled out ‘narco-terrorism’ and said the cause of the explosion was still under investigation, the commander of the Fifth Military Zone, General Eduardo Zarate said that investigators had recovered C-4 explosive and a cellphone-activated detonator in the Ford Focus (or Taurus) that blew up. The Ministry of Public Security said that the killings were a reprisal for the capture of the Jesús Armando Acosta Guerrero, aka “El 35”, who was a leader of “La Linea”, the armed wing of the Juárez cartel. Juárez mayor José Reyes Ferriz described an elaborate ambush during a press conference: Unknown suspects drove up and dumped a body dressed in a police uniform, shot him, and drove off; the emergency services received a call about the shooting; rescue personnel and police arrived to investigate and provide assistance to an apparent officer down (who appeared to still be alive); as the police and medical personnel were working the car bomb exploded. This entry was posted in Drug wars, Military, Security and tagged Arturo Chávez, Juárez cartel. Bookmark the permalink.